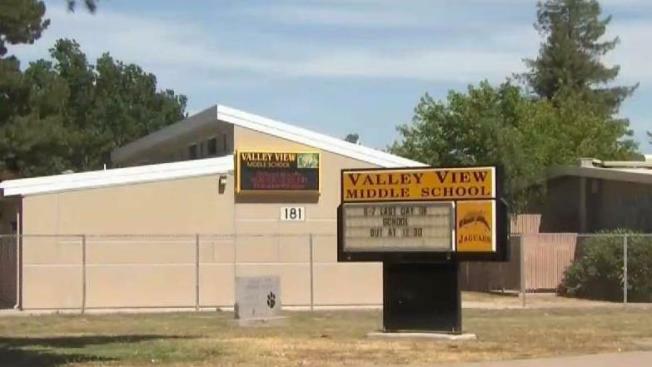 A Valley View Middle School student was arrested after he reportedly sent a Snapchat message to another student saying he would kill “at least 30 people” on the last day of school, police said. Police seized numerous guns from the 13-year-old’s home in Martinez after the Concord Police Department was notified by the FBI of the message Friday. He is also accused of posting a homophobic message to the social media platform. The student was booked into Contra Costa County Juvenile Hall for terrorist threats though he claims it was just a joke, Pleasant Hill Police said. "You can’t take these types of threats lightly," said Sgt. Brian Leonard. "We’re going to address all of them in a serious manner regardless of what someone indicates their actual intent was, if they said they were joking or not, we’re still going to take those threats seriously." Valley View Principal Lisa Sullivan sent a message to students reading, "We take every threat very seriously and wanted to inform you of one we discovered this weekend … We have partnered with law enforcement and they immediately started an investigation. As a result, they have detained an individual." Sullivan added that the school will add supervision on campus and provide counseling for students and staff to ensure they feel safe. "Student safety is paramount to all of us, and we appreciate authorities working with us to ensure all students are safe," she wrote. The FBI also released a statement Tuesday saying, "This incident could have been the next school shooting, but because of the partnership we have with our private sector and local law enforcement partners, it was prevented."